Alongside our new curator “One on One” talks, we’ll be doing occasional ‘one on one’ blog posts, from curators, staff, public, on a particular work or exhibition they’re interested in. Today’s post is from Stephanie Pau, our Manager of Interpretation. I feel fortunate that at SFMOMA, educators (like myself) are often treated as collaborators in the making of exhibitions. And sometimes, we even organize our own exhibitions in the drop-in Koret Visitor Education Center. This is the story of The 1000 Journals Project, which I recently co-curated with “Someguy”, and which is on view through April 5. Around this time last year, I’d been looking for exhibition and project ideas to complement Rudolf Frieling’s then-upcoming The Art of Participation: 1950 to Now. That exhibit, which was deinstalled last month, looked at six decades of artworks in which artists engaged the public as co-creators, and in the process suggesting the radical notion that musuems could be places of production as well as display. 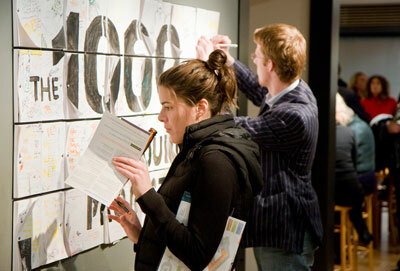 Inspired by the simple elegance of participatory exhibitions and activities crafted by the education teams at the Brooklyn Museum of Art, the Denver Art Museum and at the Victoria and Albert Museum, I hoped to craft an exhibition experience in the Center that not only mirrored the more inclusive atmosphere of Participation, but that counted the contributions of many people as essential to its existence. Eventually, my shortlist of exhibition ideas included a project I’d grown enamored with several years ago, called The 1000 Journals Project — a simple but brilliant art/social experiment launched by “Someguy.” Someguy, who is active in the Bay Area graphic design community, chose, at least for this particular endeavor, to remain anonymous. In a culture as glory-hungry as ours, I admire that Someguy was not only mad enough to launch the project with his own money, but sought to claim none of the fame that might come with it (granted, his identity is among the worst-kept secrets I’m privy to, but still…). 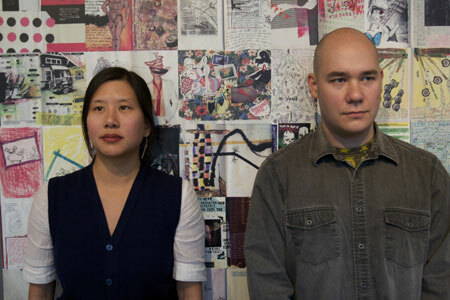 Stephanie Pau and “Someguy”, in front of reproduction screens of some of the pages from journals that made their way back home. The 1000 Journals Project began in August 2000, when — like Johnny Appleseed — Someguy began “planting” a thousand blank journals around San Francisco — dropping them in bus shelters, park benches, even bar bathrooms. Each book was stamped with only minimal instructions for adding to, sharing, and (eventually) returning the books, and left Someguy’s hands with his faint hope that one day he might see what became of them. In the years since the project started, the books have circulated from stranger to stranger, traveling to Palestine, Tokyo, the top of a mountain in Croatia — places many of us may never see in our lifetimes. The project seemed ripe for some form of exhibition. Within days, we (meaning me and Peter Samis, Associate Curator of Interpretation) cold-called Someguy at his graphic design office with our idea and, lucky for us, he was more than game: he had already been searching for a venue to host an exhibition for the thirty-plus books that finally made their way back “home”. Our primary challenge, and goal, with this exhibition was to find ways to overcome the tacitly understood codes of “behavior” that visitors, myself included, bring with them to the museum. Rule #1 in nearly all but the most progressive arts and culture museums? : Do not touch. Working closely with Someguy, in-house graphic designer James Williams, and Senior Museum Preparator John Holland, we developed a concept and design for the exhibition that was, in retrospect, a true anomaly for museums: it emphasized the “anti-precious” nature of the work on display. Vitrines, frames, and pedestals — the common modes of display (and protection) — were not an option. After all, the “art” wouldn’t exist if the books were placed behind glass: it was imperative they could be drawn in, written on, touched, added to, or even destroyed, depending on the whims of the participants. Someguy, and The 1000 Journals title signage. We hoped to break down the rules of engagement from the beginning, with an unusual approach to signage. 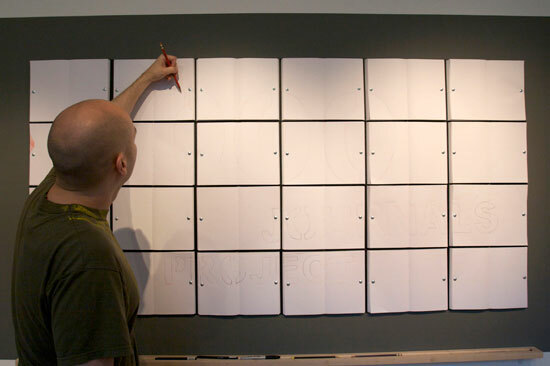 We installed a grid of blank journals that displayed the sparest outlines of the words in the exhibition title. Our somewhat fanciful conceit was that the rest of the title might be filled in by the doodles and unfiltered entries of visitors, using writing implements we provided on a chalkboard rail beneath. When designing mounts for the journals themselves, we found inspiration in the old-timey editor’s desk, whose inclined surface allowed for easy reading and also an ergonomic surface for those who chose to add their own entries. 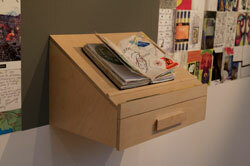 John’s design included a drawer at each station, which held pens, glue, stamps, and other ephemera that we hoped might inspire visitors to keep adding to the books. A thin ledge allowed us to place pens on the surface — another signal that these books were as-yet unfinished works-in-progress, and invited participation. Finally, John recycled the wood from platforms we’d created for The Art of Richard Tuttle and built a lovely communal table that we placed in the middle of the KVEC Lounge area. We wired down four of the journals from the original one thousand and put out buckets of drawing materials, old magazines, and glue. Stephanie Pau is Manager of Interpretation at SFMOMA. She studied archaelolgy, not art history, and used to write extensive reports about things she excavated in one-by-one meter pits in tiny towns across California. She has a gift for creating and consuming vast amounts of soup, and can sometimes be found hunting for mushrooms in the Bay Area’s lovely oak woodlands.